Phoenix’s Green New American Vegetarian restaurant is our pride and joy – it’s the kind of place where you can bring omnivores to help them to understand that vegan food isn’t just about steamed veggies, tofu and rice. The menu claims to feature “new American style comfort food,” offering a good blend of mock meat sandwiches, pizzas, fried food and bowls. However, I believe Green pushes the boundaries of “comfort food” by bringing exciting new flavors to well-known dishes, redefining what vegan cuisine can be. 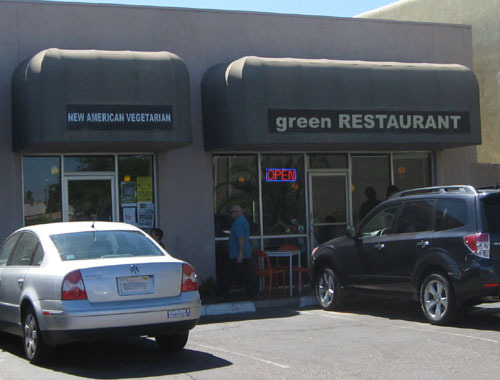 Green is located in a humble strip mall just close enough to ASU to draw in young people on a college budget, but also near enough to “Old Town Scottsdale” to attract older people with an interest in healthy eating. 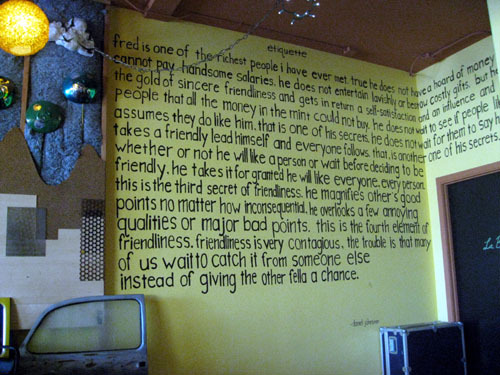 Any restaurant with a quote from Daniel Johnston on the wall has the potential to be “too hip for you” and intimidate the “regular folks,” but instead, Green is friendly and welcoming. You’ll always find a diverse crowd there. Since we go to Green often enough to have explored most of the menu, I’ll only highlight two of our favorites in this post – the Spicy Peanut Chicken Salad and the Secret BBQ Chicken Sandwich. I like the Spicy Peanut Chicken Salad so much that I have a hard time ordering anything else. I had never tried a “chicken salad” before eating at Green – neither mock chicken nor actual dead bird. I’m the quintessential fussy eater who grew up using different pieces of silverware for each item on my plate and getting upset if the peas touched the mashed potatoes (aka nightmare child at a restaurant). The idea of a mayonnaise-based chicken-like mystery concoction makes me want to retch, and the modern chicken salad – pieces of grilled chicken on a bed of lettuce – befuddled me. A salad is a salad, chicken is chicken, and the two should never be mixed. I have even stronger anti-taco salad feelings, which I have yet to overcome. But, during one of many visits to Green I glanced at another table’s food and asked a server what they were eating. Upon learning it was the Spicy Peanut Chicken Salad I thought, “That’s a chicken salad?” It contradicted all of my preconceived notions of what a chicken salad is meant to be. The next time I went to Green I got bold and gave it a try. I now wonder what I’ve been missing. The first thing I appreciate about the salad is the lettuce – it’s a basic, non-ambitious mixed organic baby greens. It gets a little wilty under the weight of the dressing and chicken, but its foundational flavor doesn’t contradict the variety of tastes in the salad by being overly bitter or sweet. I’m also not interested in having a bunch of wasted “stuff” in my salad (except when it comes to the salad at The Breadfruit, but we’ll save that for another post). Anything in the salad should be designed to either provide a texture contrast and/or soak up the dressing. Period. The crisp julienned carrots and thin, crunchy potato sticks do their jobs well. The dressing knocks down my second preconceived notion – that salads, in general, are boring. The miso vinaigrette dressing is tremendously tangy – a perfect complement to the spicy chicken. 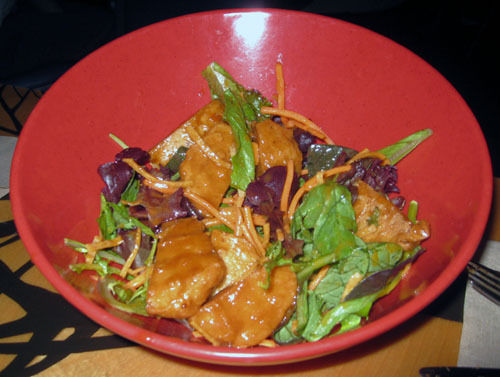 The (mock) chicken is sliced thin, grilled and coated with the same peanut sauce that is used in the Thai peanut bowl. They aren’t kidding with the “spicy” part either – I usually have to grab an extra napkin or two for my runny nose. You would think the miso vinaigrette and the peanut sauce would create a noxious, mis-matched blend of flavors, but they actually remain distinct tastes that don’t create a conflict in your mouth. 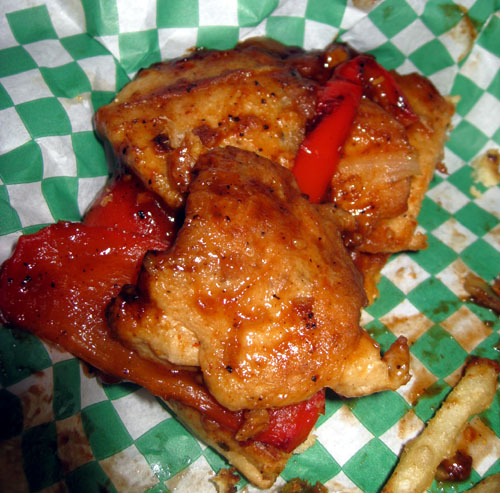 My second favorite menu item is the Secret BBQ Chicken Sandwich, served with thyme fries. The sandwich is pretty straightforward – a standard hamburger bun loaded with thinly sliced grilled mock chicken, caramelized onions, red and green bell peppers and vegan mayo (which I leave off, due to the previously mentioned retching sensation I get at the thought of mayo – vegan or not). 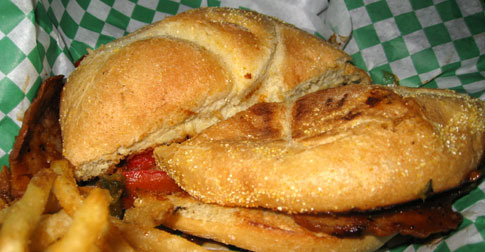 The “secret” of the sandwich is in the barbeque sauce – it’s an “espresso” sauce. I don’t know exactly what that involves, given it’s a secret, but it is tangy, mildly spicy, slightly sweet and very messy! I’ve never had a barbeque sauce like it. I’d buy it for home use if I could (along with that miso vinaigrette and Thai peanut sauce). Both of these menu items require that you are down with the idea of mock chicken, which I think Green does better than any other place I’ve eaten at. It has the same texture and stringiness as chicken, without the death part, so I’m all for it. The flavor comes from whatever sauce they put on it and it’s been so long since I’ve had chicken I’m not sure what “tastes like chicken” tastes like anymore anyway. Just wash it all down with a glass of fresh-brewed iced green tea with a dash of fresh lemonade and you have a fine, fast and flavorful vegan meal! Green is on Facebook and Twitter, and is open Monday – Saturday 11:00 a.m. to 9:00 p.m., and closed on Sundays. oh how i wish i could go to green. Looks like you’re headed out west so you should swing by! Phoenix in the summer is… well… we have air conditioning. Thanks for the review. I will go there next time I am in Phoenix. Here is a link to many raw food restaurants and/or vegan restaurants throughout the U.S.
LOVE the Secret BBQ Chicken Sammie with Fries! Green just posted on their facebook page that they have Daiya again! Green is the best! I live in the Bay Area and we don’t have anything as good. Luckily I go to phx all the time! I’m sad that I missed their “chicken cordon bleu” special this week! I bet it was awesome! The greater Phoenix area has more to offer than you'd expect for people with vegetarian and vegan lifestyles. This site will highlight restaurants and retailers that I think are okay for animal-friendly consumers. I'll also try to point out "don't bother" places. After all, vegan dining should be about more than just fries and a salad.